1a, 1b, 1c Good afternoon ladies and gentlemen. Welcome to i-Garden - a world which aims to visualize user interaction data. Before I start my talk, I would like to thank the VLearn3D Advisory committee, AW, and all the many people which help convert this digital space into an exciting place - a place for teaching, research, and collaboration. I am VERY proud to be part of this community. Meow -- one of my students -- will help to compile questions. Please feel free to wisper to her at any time. Now, let the talk begin. We are being overwhelmed with the data of more than five thousand years and more history than any one person can absorb. 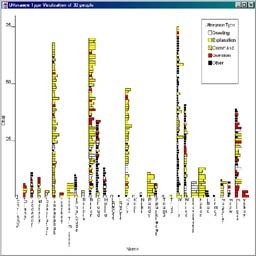 Information Visualization (IV) techniques can be utilized to transform data and information that are not inherently spatial, into a visual form allowing the user to observe and understand the information. In parallel, collaborative 3-D virtual worlds (VWs) are rapidly growing in size and number of simultaneous users. These 3-D worlds can be (and are used) to create shared knowledge spaces also called information landscapes that exploit human spatial perception and memory. 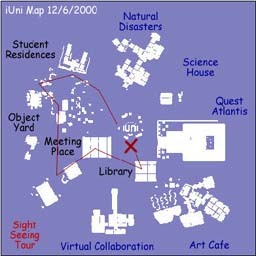 However, new techniques are needed to augment virtual worlds, to evaluate and optimize them, and to study their evolving virtual communities. 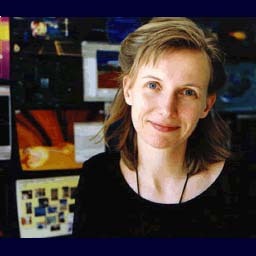 At Indiana University, my research lab focusses on the design of collaborative information visualizations. In particular, we are interested in creating a shared resource space of online documents for faculty and students at our School of Library and Information Science (SLIS) (left image). iPalace will provide access to about 8,000 online documents (text, images, video, software demonstrations, etc.) for faculty, staff, and students at SLIS. About 300 people will be able to contribute new documents and to annotate documents converting iPalace into a truly collaborative 'Memory Palace'. 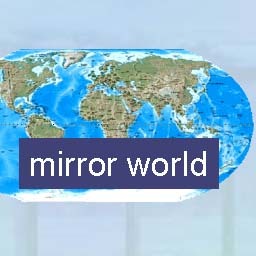 A second world - called Mirror Palace - will be used to visualize user interaction data such as navigation, manipulation, chatting, and Web access (right image). For more information see http://vw.indiana.edu/. 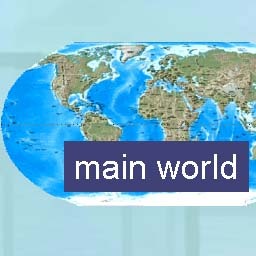 This 'Twin-World' combination aims to guide users, to augment the design and evaluation of virtual worlds, and to provide a tool to research virtual worlds and their evolving user communities. What places to see, what to do? What are the most popular places? What is new? Who is online? Whom can I ask for which information? 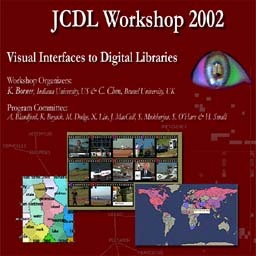 Where do users login from? Who are they? How long do they stay? Do they login regularly or irregularly? How many people are in the world at which time? Which general routes do users take? What are the most popular places? How do people move and place themselves in urban space? Are there well-traveled paths that may indicate a particular problem solving strategy? Which places are multi-way branching places, pass through places, or (final) destination areas? Who manipulates which objects, when? Which places in 3D are used for long, intricate, never-ending discussions and which are sites of quick exchanges? How long, about what, whom do people talk to? What is the size of conversational groups? How do conversational topics evolve? How does the environment influence conversational topics? Which web pages are accessed by whom, when, from where, and how often? Chat log files can be analyzed based on how often particular individuals talked about specific topics (middle). 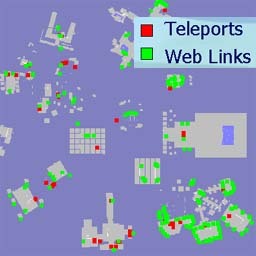 Teleports and web links can be plotted on the map (right). 4a, 4b, 4c However, all these visualizations are rather static. Utilizing the world.log file and AWs SDK one can create dynamic maps. 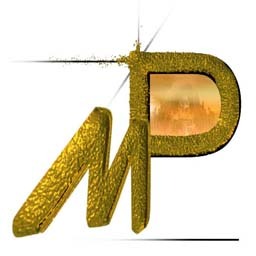 iPalace and iGarden are envisioned as 3-D dynamic �twin worlds�. 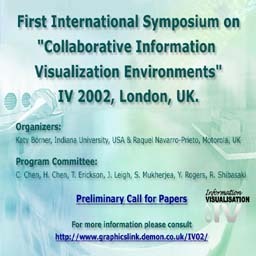 In fact, both worlds are "Collaborative Information Visualization Environments" that facilitate (1) Collaborative information access & management. (2) Communication among users. 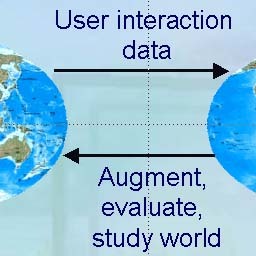 (3) Visualization of user interactions. Both worlds will come with a 2-D web interface and a 3-D collaborative space. Both are automatically generated and updated based on user interaction data adapting to changing needs and user behavior. 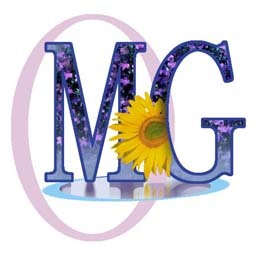 Thank you for your attention - I will be happy to answer your questions.